In this fast moving world, you literally live on to-do lists and reminders to create a balance between your professional and personal lives. Most of you live off sticky notes or a diary to keep your notes organized, but it is truly difficult to manage these notes, and keep them organized. With smartphones and tablets so widely available, it will be the smartest option to manage your daily or weekly tasks with a smartphone application. It’s easy to replace pens and notebooks with a more efficient notes-taking app. From wireless syncing to tagging and discovering older notes, these apps keep all your notes organized. nPad, a notes-keeping app designed with an aim to provide better user experience and quick options to navigate through major features of the application. nPad mobile application is available on iPhone, iPad, Android Smartphone, Windows Phone and Web too. Smartphone users can download the application from iTunes, Google Play Store, Windows Phone Store. A multi-platform nPad app provides different types of options to create a note such as, Text Note, Image Note, Create Note by scanning QR code. The created notes can be synchronized on cloud server and made accessible anywhere, anytime. The notes created on one device can be easily synchronized on cloud server. You can access the notes using any device by just logging into same account. Share notes to friends by natively available social sharing options. Save your notes in a folder by giving it the name you want to like Personal, Official, Family, Friends etc. With nPad, store your sensitive and personal information by Security lock option. View list of already created tags and notes under tag. Along with all above major features, nPad also provides options to add quick shortcut of notes on smartphone home screen. 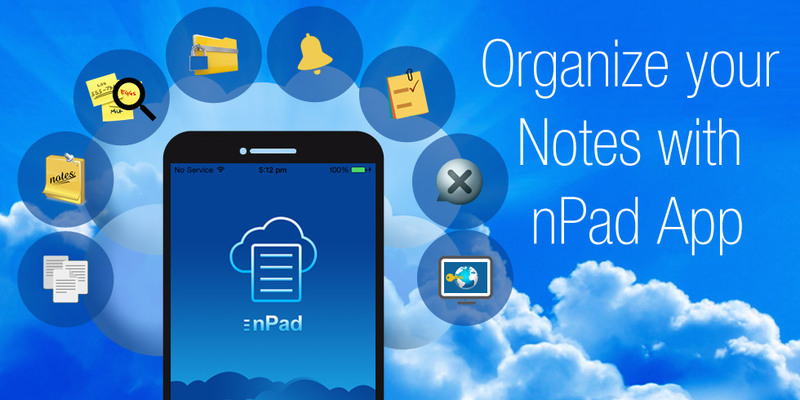 Thus, nPad is a quick, simple and intuitive notes-taking app which helps you to organize your important tasks & reminders, keep all your information at one place, access notes even when offline and sync across all device and also from web. Semaphore Software is a leading mobile app development company. We offer specialized Android app development services. You can contact us through info@semaphore-software.com to know more about the services we offer.